"There are no secrets to success. It's the result of preparation, hard work and learning from failure." Nilesh Shingote is an enterprising person with a knack of capital markets. He holds a Master of Business Administration degree in Finance & B.M.S degree In Marketing. Having done 4 months Internship with investment banking firm, he captured much-needed expertise. He also has worked for more than a year as an Assistant Commodity Analyst. His interests revolve around Fundamental Analysis and investment banking. 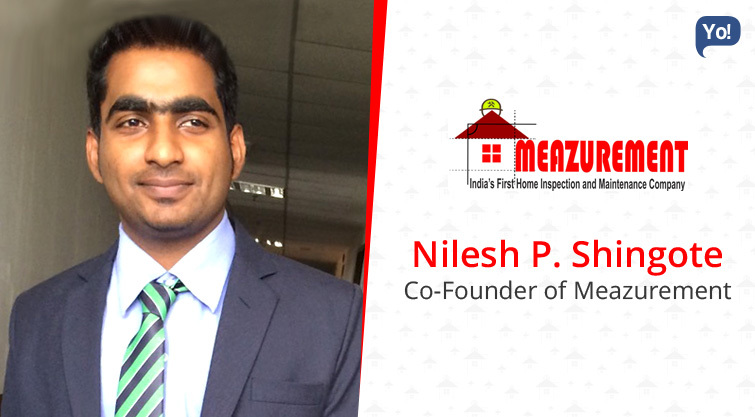 His stint at entrepreneurship started with Meazurement, which is a home inspection & maintenance startups. The team is composed of a group of inspectors, each an expert in their field. Together, these inspectors conduct a comprehensive whole house inspection in about half the time of the average inspection. We give unbiased home inspection services to home buyers which protect them from fraud, potential costly repair and carpet area shortage. Now we have entered into home maintenance services like plumbing work, electrical work, annual maintenance etc. People awareness, Home buyer are not aware of home inspection services and existing laws which can protect them from such fraudulent activities. We are providing best quality service to our clients. We believe mouth publicity is the only way to succeed and overcome challenges. As we are India’s first home inspection company, we want to expand our operation all over India.